The following sanding and polishing drill accessories are used on electric drills for general purpose preparation and sanding work, or for the buffing and polishing of various materials. For drills, wire brushes have a ¼” (6.35mm) hex shank and are adept at removing rust, paint and varnish from steel, cast iron and most metals, as well as grease from BBQ grills. There are two main types – brass-coated steel and steel. The brass-coating on the the former makes them very resistant to rust, and the filaments are usually crimped for less-agressive brushing. 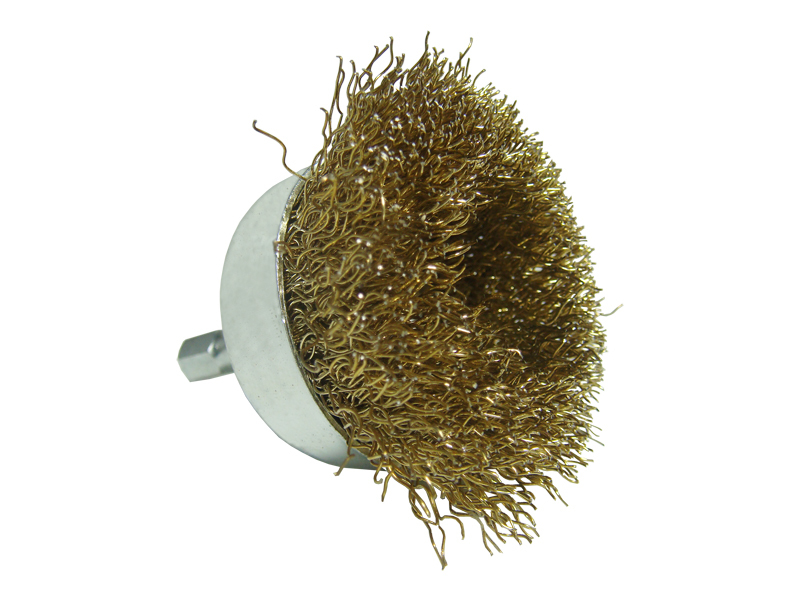 The wire filaments on steel wire brushes are either crimped or twist-knotted for more aggressive brushing. Different styles and sizes are available to suit different jobs too. The most common styles are the narrow-faced brush, the cup brush, and the end-face brush. 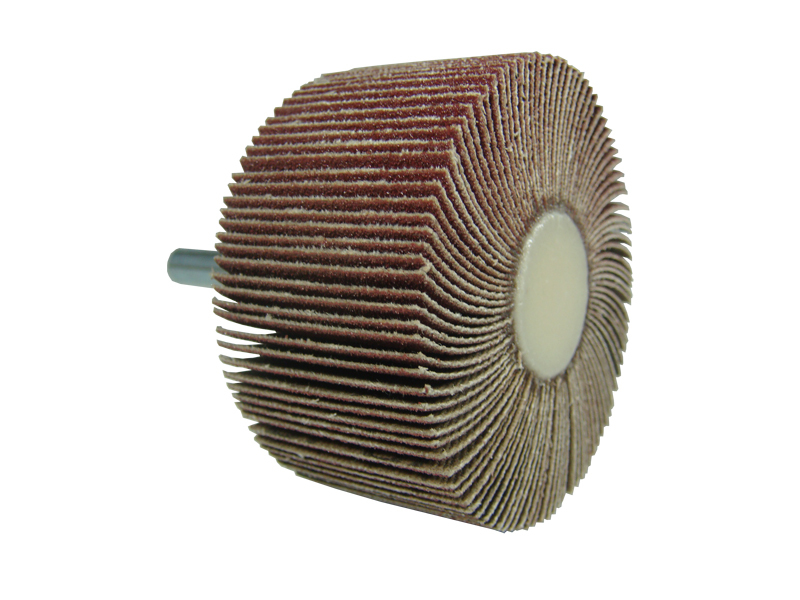 There is also an extensive range of wire brushes available for angle grinders. Wire brushes should not be used on stainless steel or aluminium because the steel wire will cause ‘after rust’. Stainless steel brushes are available for this purpose. During use, wire filaments may make a speedy exit from the brush in your general direction. To prevent any from visiting you, make sure you are wearing the correct protective equipment (click here for more information). 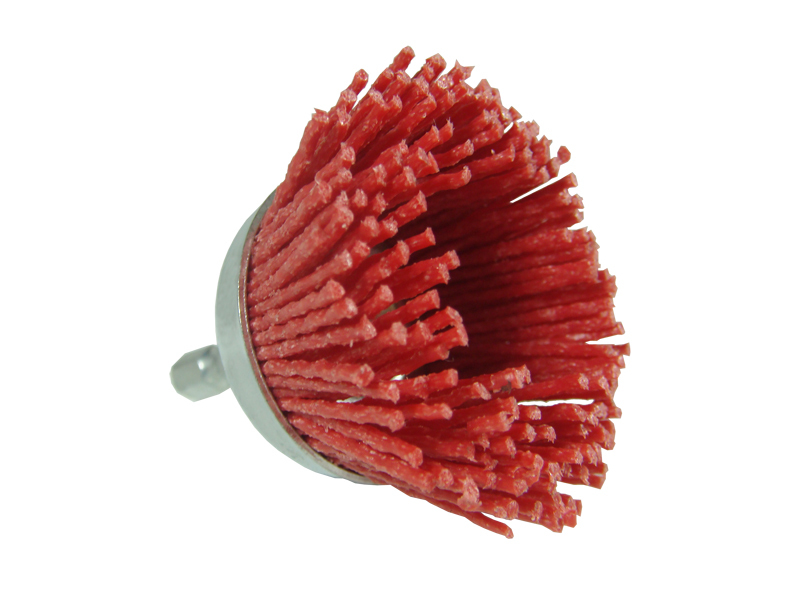 Abrasive nylon brushes feature nylon filaments that are impregnated with an 80 grit abrasive. As the filaments wear, new abrasive is revealed, leaving you with a very consistent finish on your work. The main difference between abrasive nylon brushes and wire brushes however is that the nylon heavily reduces filament breakages. 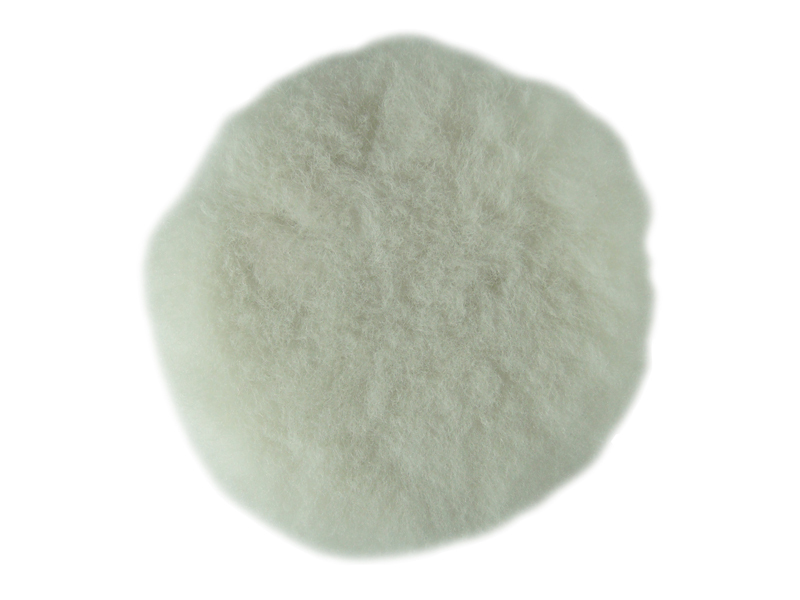 This is due to the flexibility of the nylon, which also stops any scratching on surfaces. They are extremely effective tools for use on any kind of wood, metallic surfaces, masonry, plastics, and stainless steel and aluminium. They also give a very interesting three dimensional ‘rustic’ effect on soft wood by scouring out the soft grain and leaving the hard grain standing. 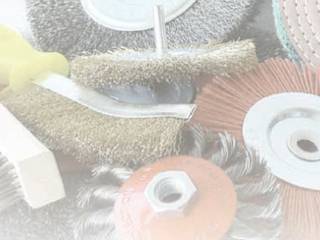 Before you use a new nylon brush, you must run the brush against a rough surface for about 10 seconds to expose the abrasive grit in the filaments. Strip-it wheels are ideal for the removal of rust, paint and graffiti from steel, stainless steel, timber, fibreglass, aluminium, granite, brick and most other metals. They are also great for general purpose sanding of materials like fibreglass, aluminium, and weatherboard panels. For drills they are designed to be used on their edge, and are available in single and double width, as well as in a range of diameters (usually from 50mm to 100mm). 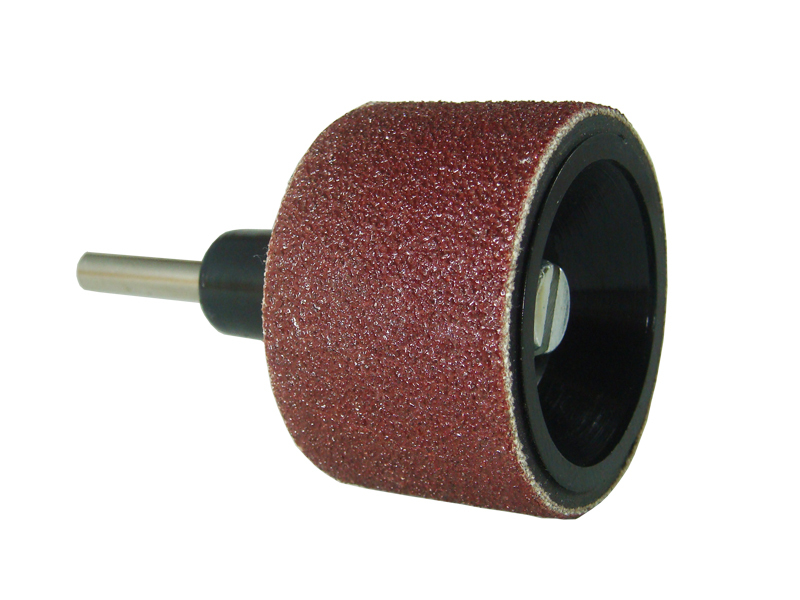 Flap wheels are used for a wide range of sanding purposes on both both flat and contoured surfaces. Their design is such that as their flaps wear down, they expose new abrasive (just like abrasive nylon brushes) to maintain a consistent, smooth finish without any clogging. Their applications include finishing, light deburring, and cleaning, and they are effective on nearly all materials, including most metals, plastics, and masonry. Also available is a similar accessory called a ‘contour sander’ that sands curved and irregular shaped surfaces with even greater efficiency. When using flap wheels on a work piece that is either moving or rotating, the flap wheel must always rotate in the opposite direction. Rotary drum sanders are covered in a small round sandpaper belt and are designed for sanding wood, metal and plastic. They are generally about 40mm in diameter, but do come in smaller sizes, like those designed for rotary tools. Different grits of sandpaper are available, and upon replacement it’s simply a matter of slipping the old one off and the new one on. These round sheets are typically designed to fit on either a 125mm (5”) or 180mm (7”) rubber backing pad , and are designed for general purpose sanding of wood and metal. They come in a variety of grits, with the most common being 40 grit (very coarse), 80 grit (medium), and 120 grit (fine). Because these sanding attachments do not act in random orbital motion, you cannot put the sanding sheet completely flat on the sanding surface. For the best possible result however, try to hold the rubber disc as flat as possible to the work (ideally a 15° angle), and run them at a maximum speed of 3000rpm. Rotary rasps are designed for rapid shaping and cutting of wood, plastic and rubber. They come in a variety of shapes and sizes, including cylindrical, conical, and ball ended, and need to be run at varying speeds according to their diameter (this is stated on their packaging) to ensure long life and optimum effectiveness. 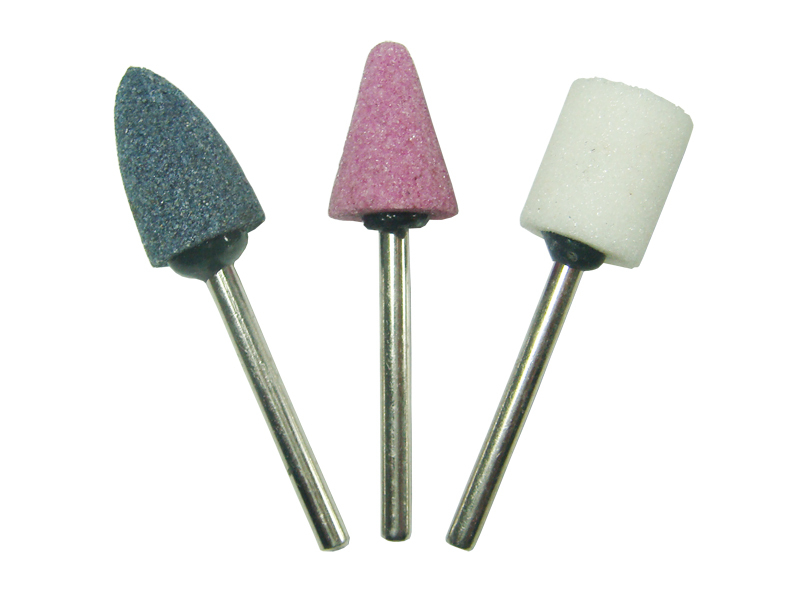 Mounted point grinding stones are are used for grinding, sanding, deburring and sharpening, with each colour indicating varying grades of abrasiveness. They can be used on a wide variety of materials including both ferrous and non-ferrous metals, fibreglass and plastic. 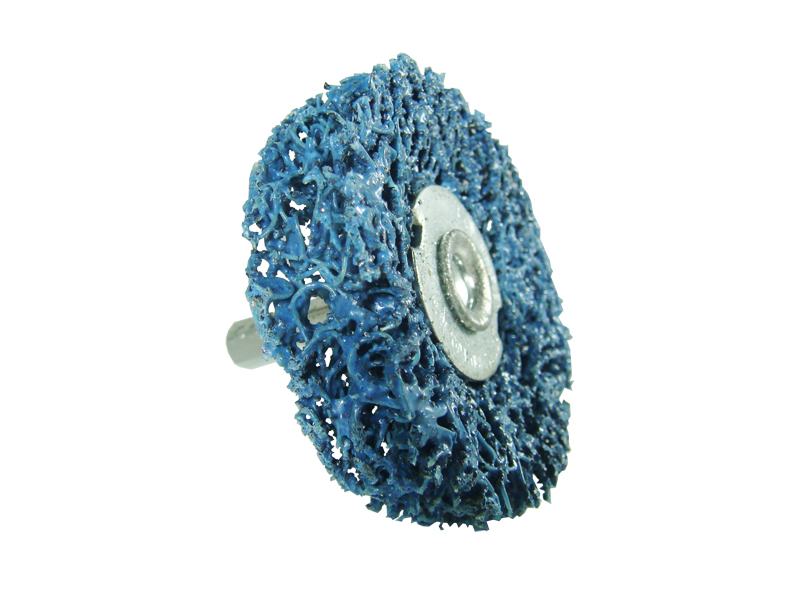 A wider variety of these grinding stones are available for rotary tools. 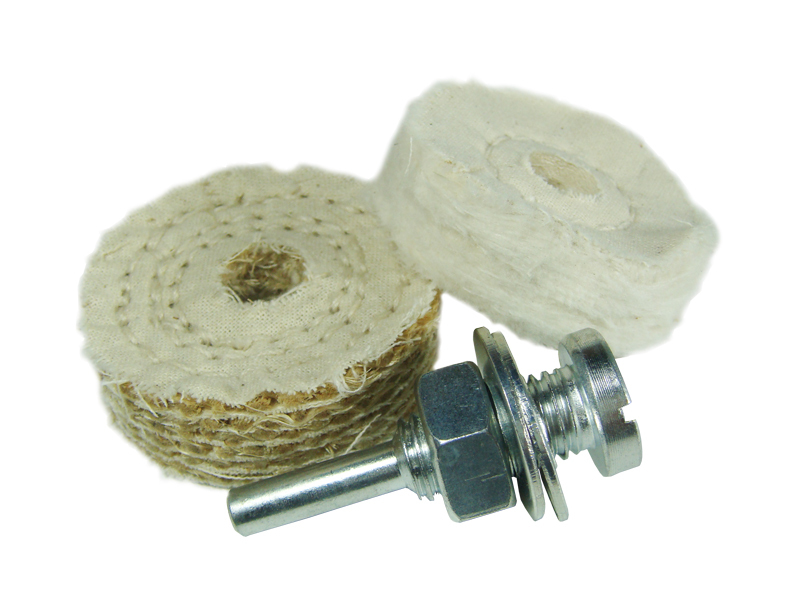 Polishing wheels for drills come in two main types – a sisal buff for “cutting back” and a loose leaf calico buff for high gloss polishing. They can be used to polish a multitude of materials, including metals, plastics, aluminium, stainless steel, copper, brass, chrome, silver and gold. A detachable steel arbor allows any drill to grip onto them. For the most effective results, polishing wheels should be lightly and frequently dressed with polishing compounds that directly relate to the job at hand. 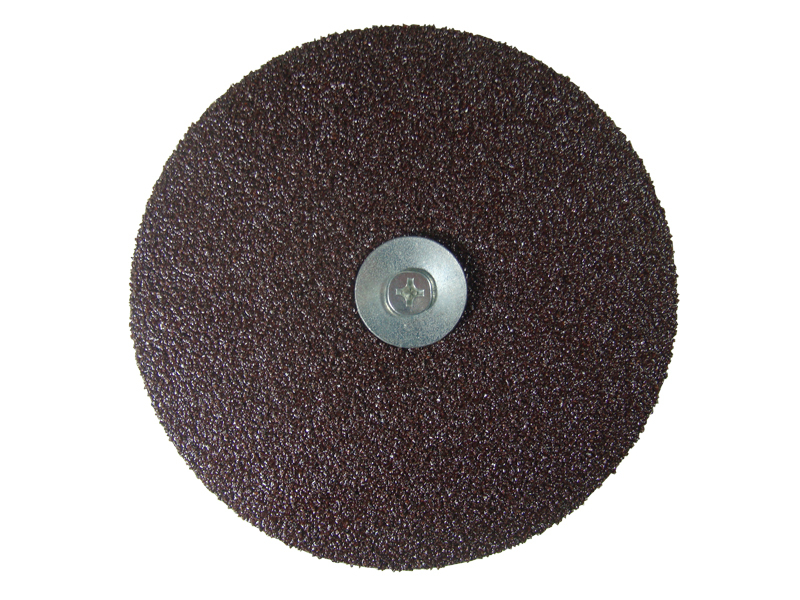 In its lifetime, a single polishing wheel should only be used with one polishing compound. For information regarding these compounds, consult the wheel’s packaging. With the use of the correct rubber backing pad (the same backing pad as used on sanding discs), it is possible to attach polishing bonnets to a drill. They are generally used for polishing cars, boats and motorbikes, and are most commonly available in 125mm (5”) and 180mm (7”). Polishing bonnets can generate a lot of heat and can easily burn paintwork if not used correctly. The following are a few pointers that will help you get the most out of your sanding and polishing drill accessories. Never exceed the maximum speeds specified on the accessory’s packaging. Most sanding accessories require at least 1000rpm to operate effectively. Never apply excessive pressure – always let the accessory do the work. A drill with two gears is ideal for sanding applications. The higher speed can be used for sanding and stripping, and the lower speed for light finish sanding and smoothing off. When using sanding accessories, if the rate of material removal is inadequate, use a coarser grit. If using an wire brush, always brush at an angle to the work and only with the tips of the wire. This will ensure minimal wire breakage and a long life from your brush. It is a general rule that the larger the accessory the more effective and efficient it is. Therefore, always use the largest accessory the job will allow. 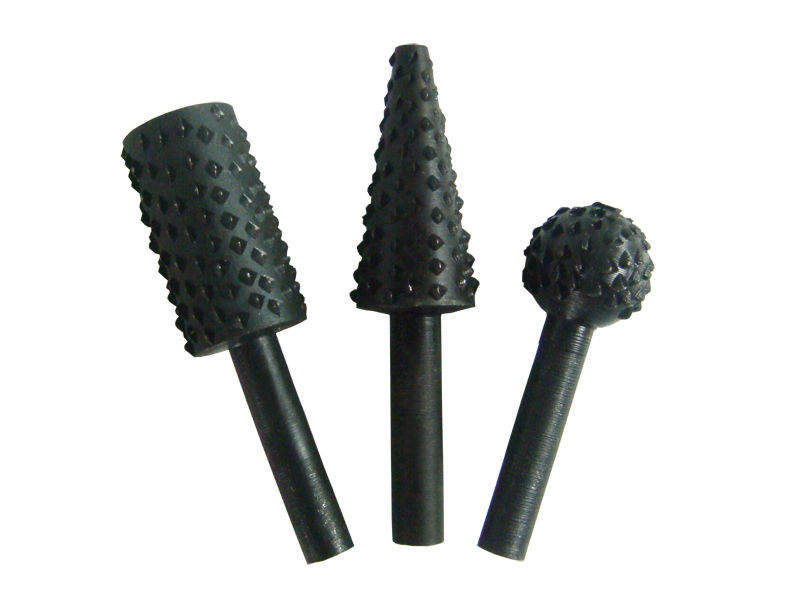 Sanding and polishing drill accessories that are smaller in size are only manufactured for those hard to reach spots that cannot be reached otherwise.